There are a variety of ways to see your academic information in Populi. This article tells you what you'll find on My Profile and how to find information, grades, and more for specific courses. Dashboard shows you what you need to know about your course right now and tells you what's coming soon. It includes alerts about lessons, tests, discussions, and assignments; a schedule of upcoming meeting times and other events; a list of currently-available discussions; and the course bulletin board. Info shows you essential course information—everything from description to availability dates to number of credits/hours. You can also find the course reading list, files, supplies, and links. Assignments gives you a list of all the coursework your professor wants you to know about. Discussions are online conversations between your course's professor(s) and students. Conferences are live video/audio sessions conducted by your professor. This view only shows when a conference is currently in session. Calendar shows every event occurring in the course—meeting times, assignment due dates, test availability, lesson start dates, and any additional events. Roster shows you who else is taking the course. Chat are scheduled real-time discussions that are meant more for conversations, quick thoughts, and so on. My Courses gathers together all of the courses you're taking or have ever taken at your school. The Dashboard shows you all your current courses (in which you're enrolled or auditing) together with a selection of past and future courses. You'll see alerts for your current courses—these are the same alerts you'll see on your Populi Home page. All Courses lists every course you've ever taken at your school. The Student view on My Profile collects or links to all of your courses and academic information. Your transcript is a complete record of the courses you've taken at your school (including any transfer courses that have been applied to your program). Your degree audit is a tool that compares your courses and academic performance to your school's degree requirements. On the right column of the student view you'll see your courses, degrees, programs, honors, and student information. Export grade report: Lets you create a PDF of your grade report for any term in which you've received a final grade for all your courses. Export schedule: Creates a PDF of your course schedule for any term. Print enrollment verification: This letter verifies your enrollment in courses for the term you select. Student information includes stuff like your student ID number, academic advisor, and whether you're required to have a proctor for online tests. Your school may also add custom information fields here—if you have any questions about these items, contact your advisor or a staff member. Courses shows you the courses in which you're registered (enrolled, auditing, incomplete, withdrawn) at this school—past, present, and even future. It starts by showing you current courses—those that have started and have not yet ended. Use the selector to see courses from particular terms. Click the course name to go to its page, where you can find lessons, take tests, upload assignments, post to discussions, and get updates and other information. As soon as your professor has given you any sort of grade in the course, you'll see your in-progress grade here. If you withdraw, you'll see a W; if auditing, AUD; if incomplete, INC.
indicates that the course has been finalized: it is now closed and your grade and other details have been committed to your permanent academic record. A program is a course of study that encompasses a particular group of courses. The Programs section tells you which program(s) you're currently listed in. You get listed in a program when you pursue a degree (or when a staff member lists you in that program). You can be active or inactive in a program. Your transcript contains a complete record of all of the courses included in a particular program. A degree is the award you get for completing a course of study. The status indicates whether you're pursuing the degree, have stopped pursuing it, or have been granted it. Catalog year refers to which academic year's requirements you're being held to in order to attain the degree. Anticipated completion is the date by which you'll most likely complete the degree. If you're pursuing a major or a minor, you'll see it listed here, too. Your degree audit lets you compare your academic history to the requirements for your school's various degrees. Honors are awards your school notes on your transcript. They may be connected to your enrollment in a particular program, degree, or academic term. 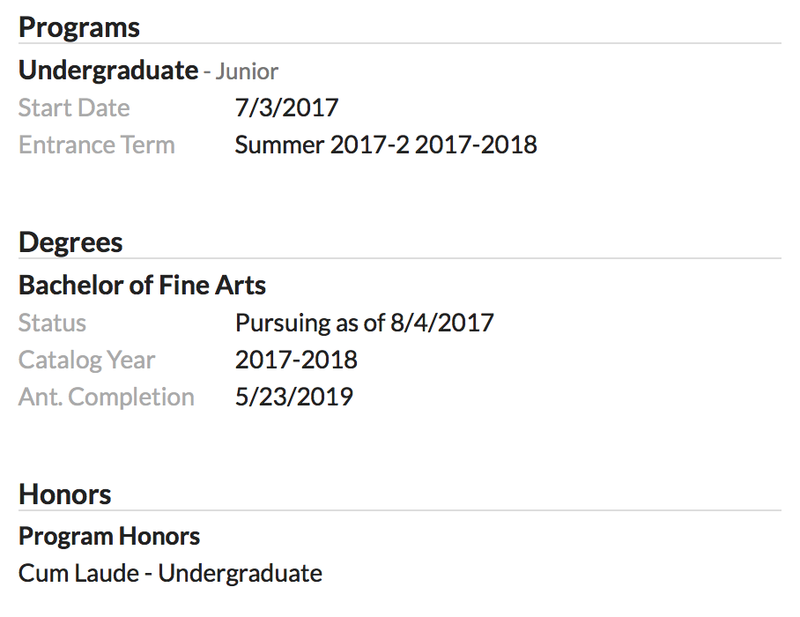 Depending on how your school chooses to handle them, honors may appear on your transcript when it is exported from Populi.